Every waking moment, you get to choose: you can be right or be in relationship. This is true everywhere: at work, at home, with your friends. Life is that simple, and that difficult. Deciding that relationship is more important that being right means you consciously choose to “be wrong”, to be willing to let go of your hard-won truths. In almost all organizations, people are expected to be right – to make the sales forecast come true, to keep expenses to the budgeted amount, to spend only X minutes (or Y seconds) on a customer call… The Goal, Goldratt’s business novel that has sold more than 6 million copies, been translated into 21 languages, and taught in more than 200 colleges and universities, states, “The goal of a business is to make money.” The end of making money justifies the means of doing whatever it takes, as long as it is legal. 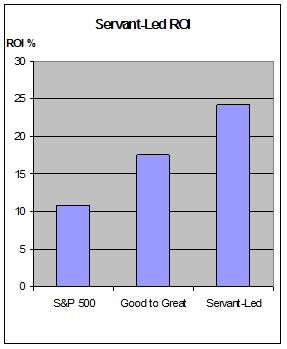 However, a little-heralded book (Seven Pillars of Servant Leadership, Sipe and Frick, 2009) demonstrates clearly that for-profit businesses that are based on relationship outperform numbers-based businesses by more than 2 to 1 (24% to 11% annual ROI). And Jim Collins’ “Good to Great” companies earned only 17.5% during the same period. The 11 servant-led companies include Southwest Airlines, Starbucks, Marriott International, and FedEx. Being in relationship supports creativity and messiness and holism. It manifests itself in peer-to-peer, self-organized teams and groups, and in love (even in the workplace!) It creates a win/win, cooperative world, in which all persons benefit. It creates supportive community. You can be right, or you can be in relationship. You get to choose, every waking moment.